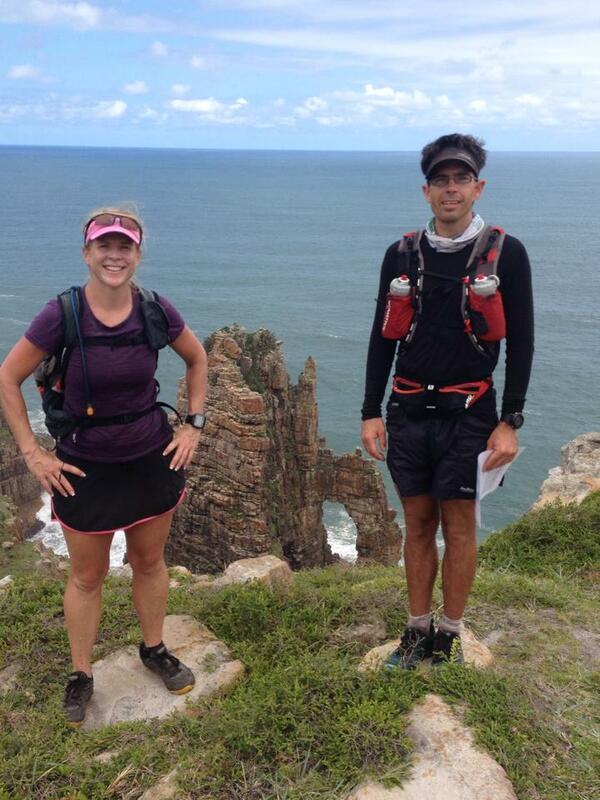 While we were running the Pilgrimage trail from Grahamstown to Knysna last year, and in an effort to manage Post Pilgrimage Depression, we chatted about running the Wild Coast in Feb 2014. 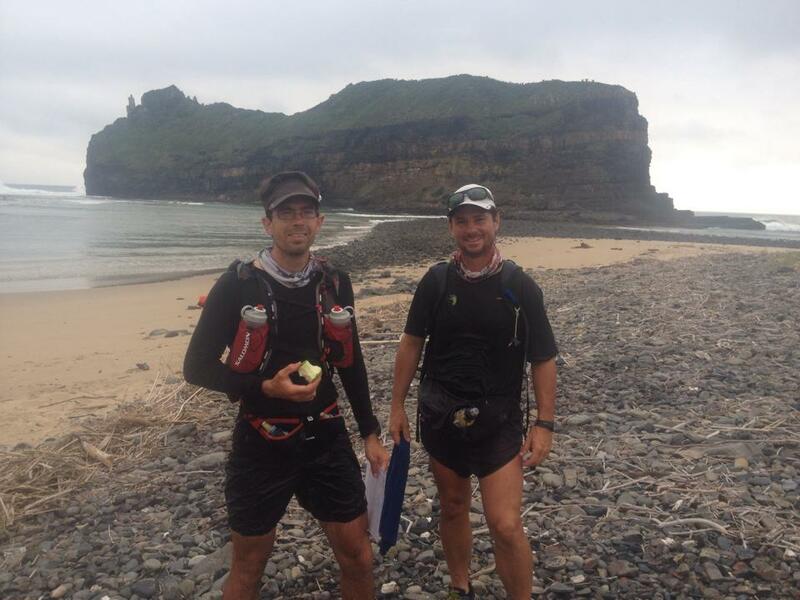 The plan was to start at Port Edward and do 250 or 300km of the best part of the Transkei without any back up, running between hotels to minimize pack weight. Filippo (with his trademark attention to detail) made all the bookings and Neville, Kylie, Roger, Filippo, Katya, Ciska and me all descended upon Plumbago B&B in Leisure Bay (some a day ahead of schedule), wild with excitement at our imminent adventure and the fun of having the Herd back together again! Despite all attempts to keep our packs super light we set off with bulging 7-8kg packs (Woolies honey and avos it seems are a complete necessity to some) and were soon jettisoning various goodies along the soft 20km of beach beyond the Wild Coast Sun (not really. Trail runners don’t litter). The first day (34km from Port Edward to Gwe Gwe) was hot and humid and fairly uneventful other than the crossing of the Mtentu River (known for its Zambezi sharks) and a marvelous lunch time swim at the Horseshoe Falls at Mkambati. We spent the afternoon wondering how we would break into the locked huts at Gwe Gwe and applying ourselves with relish to the task of lightening our load by eating and drinking with focused determination. Somehow, the next morning the packs didn’t feel that much lighter. Weight had simply been transferred from backs to bellies! The next day (40 something km’s depending on route choices!) was breathtakingly beautiful, starting off with the rest of the Mkambati Reserve, hurdling over a night adder before entering the Msikaba Gorge (WOW!) and swimming our first big river of the day. From there, highlights arrived thick and fast with the amazing breaking waves at Luphatana, the majestic Waterfall Bluff and spectacular Cathedral Rock. Although I had run this stretch before (in the other direction) I had taken a much more inland route and missed a lot of the best sights. By lunch time (where we cavorted in some pools above Waterfall Bluff) we were in a state of such drunken euphoric elation at the magnificence of it all that our navigation skills were compromised and we found ourselves on one of those annoying cliff faces that Wild Coast runners know all too well from their attempts to take short cuts. We were at point A (at the edge of a sheer cliff) and had to get to point B (only 30m away but separated by a yawning chasm the bottom of which is invisible from the top). Mmmmmmm. I had decided that there was nothing for it but to go the looooong way round when Roger decided that there was in fact a short cut. This involved sliding down a cliff only fractionally less vertical than the one at point A and dragging oneself up another using tufts of grass in the absence of more suitable and sophisticated climbing gear. I assumed at first that he was joking and rolled around in the tick infested grass shrieking with laughter until I realized that he and Kylie were already half way down cliff 1. Oh dear. I couldn’t risk the insult of being called a FM* and so there was nothing for it but to follow them. Hesitating had been the wrong thing to do because I now had to rely on tenacity of the grass roots that had already pulled both Kylie and Roger up the precipice, it would be just my luck if they decided they had now had enough. We eventually clawed our way over the lip of the abyss with heart rates skyrocketing following that heady combination of fear and exertion and began to jubilantly high five each other while the Ngunis looked bemused. Rather a lot of bundu bashing followed and we eventually dragged ourselves into Mbotyi late in the afternoon, although not too late to get our laundry (socks) washed and tumbled dry (above food on my hierarchy of needs)! I had been extremely over confident about obtaining water at all the Drifters camps and so had left Mbotyi with only a liter of water, expecting to fill up again at the 11km mark at the Manteku camp. I paid heavily for my lack of wisdom because the communal cooking area was locked, no taps were visible and there was no sign of the caretaker. It was already boiling hot, the humidity was at an all time high and I had slurped down my last water as we came into the camp. I was beginning to feel frantic. At least another 12km with no water, extreme heat and big climbs was not going to be a good idea. I spotted another holiday cottage just beyond the Drifters Camp but alas, the taps were dry. I eventually managed to fill up again about 2 hours later but by then I had dehydrated and now made the unforgivable mistake of over hydrating. It was just a matter of time until the nausea set in and by the time we hit the long beach before Port St Johns I was heaving with queasiness, dragging myself along and feeling very annoyed by my own stupidity! I decided in another moment of wisdom that this would be a fabulous time to try a bizarre and mismatched smorgasbord of everything I had to eat in my backpack. It would either do the trick and make me feel better or hasten the vomiting. Things were at an all time low as we caught a ferry across the magnificent Umzimvubu River with its swirling chocolate waters and arrived in the mad hub of Port St Johns and headed across the taxi rank to the KFC for a coke. What a contrast to the solitude of the last few days. We then set about the challenging task of finding a taxi prepared to take us to Umngazi (Where? Where?) After having called a certain Nyameko who made a vague promise of picking us up near the tourist info offices we collapsed in the shade to await his arrival. I jokingly suggested to Kylie that I thought it would be a fabulous idea to have a KFC soft serve, a large serving of slap chips and a litre of orange juice to get the nausea over with and trigger a purging. The ever solicitous Roger overheard part of my comment and came back triumphantly from a second visit to KFC , proudly bearing a tray of rapidly melting soft serves. Anxious not to seem ungrateful I ate that too. How much of an assault can one stomach take, I wonder? Just as we were about to give up and begin the long journey to Umngazi on our own steam, Nyameko miraculously and unexpectedly appeared hooting his Siyaya enthusiastically and we set off through the mayhem, pausing often to socialize, buy umbona, nudge cows out of the way and reassure potential passengers that he would shortly be heading back the same way. 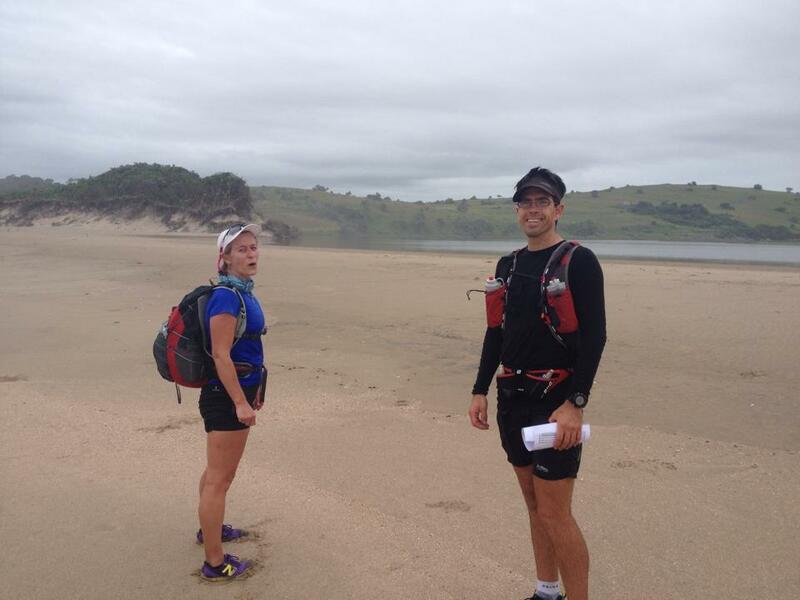 We were all rather anxious about the enormously long day (close to 60km) which would be the 4th day of running from Umngazi to Coffee Bay, especially on the back of the demanding 3 days that we had all experienced. The combination of carrying a heavy pack together with the heat, humidity, long days and tough climbs was proving to be very hard work. We decided to set off as early as possible and were on the ferry by 5am and on our way soon after. Katya had been feeling ill since she woke up and was hoping very much that she would recover as she got into a rhythm, but it quickly became evident that she was getting worse. What to do? We were miles and miles from anywhere without a back up vehicle. Neville (who is an Eastern Cape farmer and likes to simplify things) decided that her wan-ness was a result of not eating and that it could be rapidly and easily cured with protein. As Katya curled up weakly in the foetal position under the sketchy shade of a thorn tree, Neville triumphantly produced an aged boiled egg from a zip lock stored in his groin pocket and waved it enticingly under her nose. “Come on jong, Katya!” he implored. “What you need is some PRRROTEIN!” Understandably, Katya began to heave and wretch and recoiled in horror from Neville and his egg. Having expected her to devour the egg and leap to her feet with renewed vigor, Neville was bewildered by her reaction. The rest of the herd collapsed in hysteria. Little did we know that we would all be projectile vomiting within the next 48 hours and that Neville’s egg would do the rounds every time anyone showed the first signs of illness, much to the delight of everyone bar the vomiter. The only thing we could do to help poor Katya was to relieve her of her pack and help her up hills with a combination of pulling and pushing. We still had close to 40km to go and she was feeling horrendous and unable to eat or drink anything at all. When we arrived at Hluleka game reserve we decided that there was absolutely no way that she could continue and we made a phone call to the Ocean View Hotel in Coffee Bay to try to get some idea of transport options. The manager, Alex, answered the phone and when he heard our predicament he immediately volunteered to drive to Hluleka to fetch Katya. We were blown away. At least a 3 hour drive on horrendous roads to help someone he had never met. 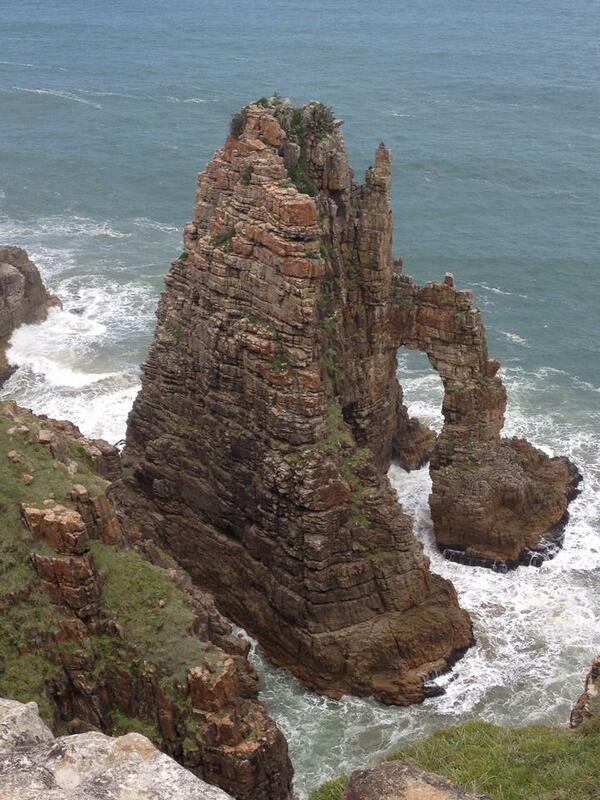 This is what makes the Transkei and the Eastern Cape such a special place. We made Katya as comfortable as we could, and set off again anxious to make up the time we had lost. We had already made our way over Brazen Head and Rame Point and had successfully negotiated the notorious mielie/dope field maze near Mnenu that had seen so many of us getting lost on previous years and were now heading towards the Mtakatye River. Roger and Kylie had in 2013 taken a route over the headland and down to the river mouth avoiding the muddy mangrove swamps of Mordor and so we decided to follow this route. What a spectacular view we had of the clear turquoise water and enticing reefs from the hill above the river mouth. It felt much like paradise but for the fact that Ciska was now starting to feel the first signs of illness too. Initially we mistook her silence for the onset of extreme grumpiness and so spent many kms delighting ourselves by dispatching Neville to suggest some relaxing and meditative Zen gardening with the toy trowel she had been awarded the previous night. (The Herd can be very cruel.) This award had been the result of being grumpy and verbally assaulting Neville when he failed to find the Umzimvubu ferry and then made her run an extra 4 km to Cremorne the previous day. Neville, who is usually undaunted by anything, was very frightened by this experience and understandably reluctant to do anything to further arouse the wrath of Ciska. This dynamic was a fabulous and hilarious distraction and provided Kylie, Roger and I with some delightful moments before we paused at Mdumbi Backpackers for a coke and realized that Ciska was as white as a sheet and just a boiled egg short of projectile vomiting! We were immediately overcome with guilt at our insensitivity and set about arranging lifts for her with the obliging staff of Mdumbi. It was a great relief to arrive at the Ocean View Hotel that evening and to settle Katya and Ciska into the “infirmary” as their room was jokingly referred to. But what now? They were both extremely ill and sweating or shivering with high temperatures. There was absolutely no way that they would be in a state to manage another hard day of running in extreme heat and humidity and would never make the 48km journey to the Haven. The healthy Herd members convened in the dining room to discuss what was to be done. We had no sooner settled down to our starters, when Brian Bannatyne (previous member of the Herd on the Pilgrimage Run) appeared like a vision at the buffet. Kylie spotted him first and alerted us with her wild shrieks of delight. We were completely ecstatic to be unexpectedly reunited with an esteemed Herd member and overwhelmed with gratitude and relief when he offered to go out of his way to deliver both of our ill runners to the airport in East London the following day. After a very difficult day, marred by anxiety about illness, none of us slept well. I awoke feeling nauseous and was not surprised to hear that Roger had also been ill in the night. Neville offered Too Much Information over breakfast about the workings of his belly and so none of us were feeling particularly strong as we set off at the start of day 5. It didn’t take much persuasion to obtain buy-in for the idea of catching a local taxi to Hole in the Wall and eliminating 10km of hard running. The lurching and weaving of the taxi over very poor roads and the blaring gospel music did nothing to help my queasiness and by the time we arrived at Hole in the Wall I was having serious doubts about my own state of health. I sincerely hope that things would get better as the day progressed. This was not to be. 10km into the day I realized that I was in absolutely no state to continue and it was just a matter of time until things fell apart in a major way. I was determined not to become the Herd’s problem and decided that the best plan would be to get to Bulungula Backpackers (which was at that stage about 12km away) and remain there until I was well enough to continue or until Peter could come and fetch me. At the end of the next long beach we came across some fishermen who offered us a lift to the Bull’s Inn at Mpame. Here we met Cameron Edwards who seemed more than happy to interrupt his day to give a us all a (cross country) lift to Bulungula. 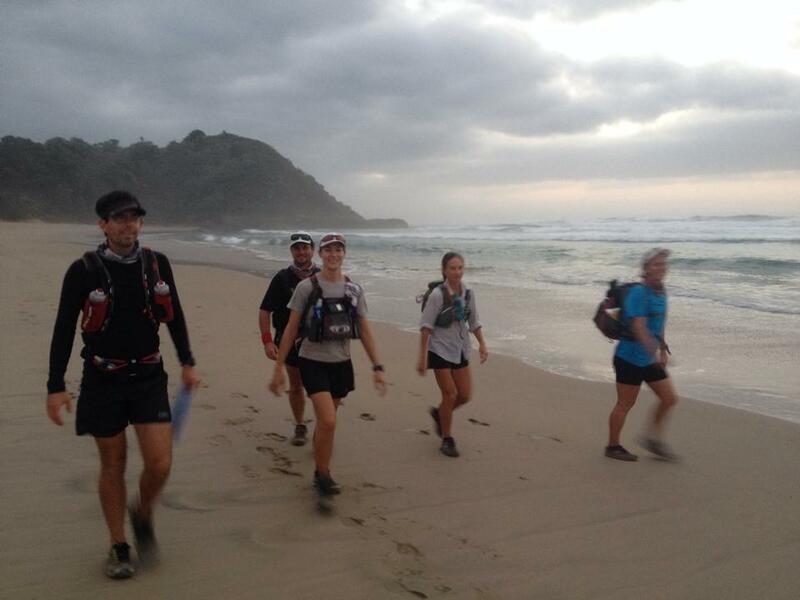 We were all once again blown away by that incredible Wild Coast willingness to get involved and help out. Half way to Bulungula, Cameron had a brain wave. There was an engineer working on a dam somewhere in the middle of nowhere who may possibly be heading home to East London that day. He wrenched the steering wheel in the opposite direction, started punching numbers into his phone and was soon hurtling wildly across the countryside towards the new destination as we all clung nervously to our seats and tried not to be ill. I was dropped at the construction site, and the herd disappeared in a cloud of dust. As I raised my head weakly to wave goodbye, my last view of them revealed that Neville was hanging out the window waving his boiled egg as a farewell gesture. I lay in the shade of the container/office retching gloomily into the abundant and absorbent crushed stone until the very chivalrous engineer, Kent, emerged from his meeting, loaded me (smelly, covered in filth and prone to projectile retching) into his pristine vehicle and drove me home (a 3 and a half hour journey). Later that afternoon Ciska and Katya arrived at my home as well and soon an infirmary had been established for the second night in a row. We heard that Neville had also succumbed at last to the virus and had been collected at midnight by his farm driver and taken home. Ciska was flying back to Durban the next day and Katya and I planned to see how we felt and possibly run to join the depleted herd at Wavecrest (having missed the nights at the Haven and Mazeppa Bay). This fortunately worked out and we ran up the coast to meet up with Kylie, Roger and Filippo for the last supper and the short run to Trennnerys. 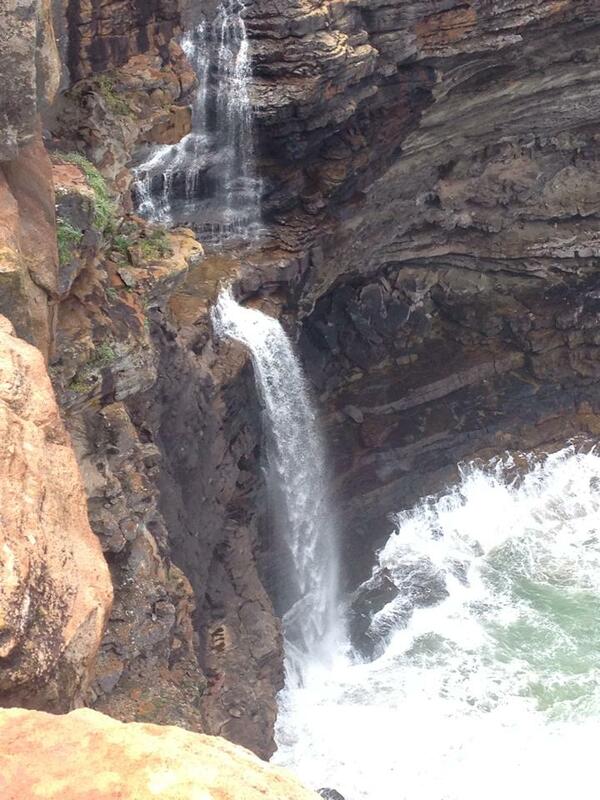 On reflection, despite the illness, this was another fabulous Wild Coast experience. We were all amazed and grateful at the incredible kindness and willingness to get involved demonstrated by everyone we met or approached for help. The crazy lifts in different vehicles and various modes of public transport added a new dimension to the adventure and actually enriched the experience in many ways. It also became abundantly clear to me that hardship, illness, pain are all extremely manageable when one is surrounded by the right people. Most importantly, nothing is unbearable if there is enough humour and hilarity. 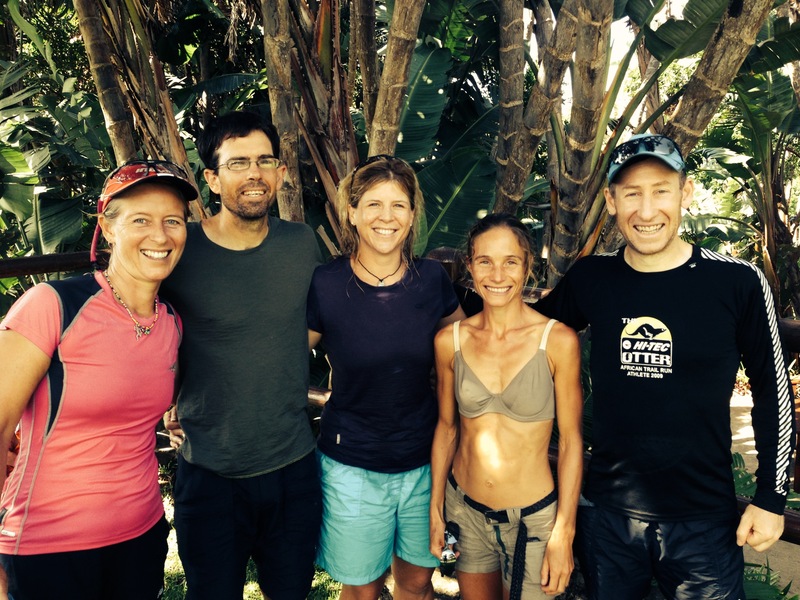 I have always had a vague, unarticulated understanding of this in the past but it has become crystal clear to me that the most important element in selecting a team or a partner for a race or expedition is their ability to crack me up (and vice versa). A tough experience is transformed if it is shared with people who share your sense of the absurd and who are able to find hilarity in even the more dire situations. There is absolutely no doubt in my mind that when laughter triggers the release of endorphins (natural feel-good chemicals) it energizes us, allow us to experience an overall sense of well-being and even relieves pain. * A “FM” is an unspeakably non politically correct insult commonly used by E Cape farmers and embraced by the Herd in a moment of irresponsibility.